Conductive Hearing Loss - Learn About Symptoms + Treatments Available! Conductive hearing loss is one of the four broad categories of hearing loss. The other categories include sensorineural hearing loss, mixed hearing loss and auditory processing disorders. The difference between these types of hearing loss depends on where the problem is located across the hearing system. 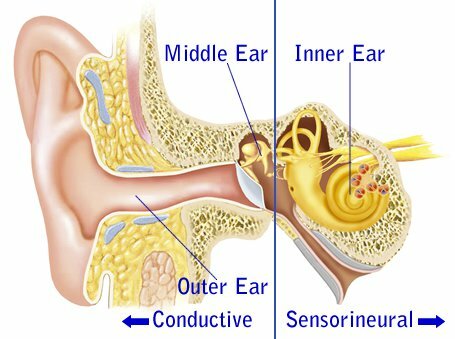 Conductive hearing loss is due to a problem within the outer ear or middle ear. 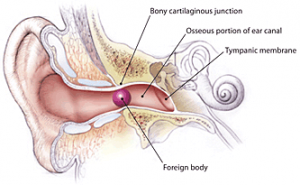 Damage or a blockage in the outer or middle ear causes a reduction in loudness that is often temporary or reversible. It can be experienced in either both ears (bilaterally) or in one ear (unilaterally) and may range from a mild form to profound form. What are the causes of conductive hearing loss? There are a range of causes of conductive hearing loss which are described below. Can conductive hearing loss be treated? Yes, conductive hearing loss can be treated through a variety of ways. The best treatment option will depend on the nature and severity of the hearing loss in addition to your individual needs and preferences. An Hearing Choices audiologist will gather a thorough case history and perform a comprehensive hearing assessment to determine the cause of hearing loss and select the best treatment option for you. Common treatments for conductive hearing loss include surgical intervention, medications, hearing aids and removal of wax or foreign objects within the ear. Who is surgery suitable for? Surgeries on the ear are performed by ear nose and throat surgeons (ENTs) and are are often appropriate for individuals with long-lasting middle ear infections, ossicular discontinuity, otosclerosis, tympanosclerosis, malformation of any part of the ear and those who’ve experienced head traumas. One surgical procedure regularly performed on children with middle ear infections is the insertion of grommets (small tubes) into the eardrum. This drains out the excess fluid from the middle ear, resulting in improved hearing. 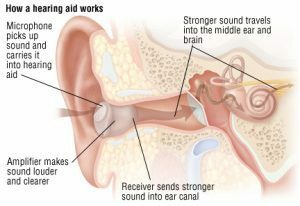 What type of hearing loss can be treated with medications? Ear infections can usually be treated with medications. Antibiotics and antifungal creams are often successful in treating ear infections and as a result returning hearing to normal. These medications can be prescribed by a GP or an ENT surgeon. Additionally, your audiologist may recommend an over the counter medication following a hearing assessment. What type of conductive hearing loss can be treated with hearing aids? Mild to moderate forms of conductive hearing loss may be treated with regular hearing aids if other treatments like medications or surgery are unable to reverse the loss. Alternatively, they may be used in the interim before a surgery is undertaken or prior to completing a course of antibiotics. For more severe forms of conductive hearing loss, bone conduction hearing aids may be a more suitable option. What are bone conduction hearing aids? Bone conduction hearing aids have a microphone that detects sound waves and transmitter to send these sound waves to the bone surrounding your inner ear. This allows for sound to bypass the outer and middle ear where there is a blockage causing hearing loss. Since this device needs to be inserted in bone it requires a surgical procedure.